That's why when Kayle asked me to guest post for her I knew I had to bake up something sweet! And I also wanted it to be 4th of July themed for the holiday weekend coming up. The 4th is one of my absolute favorite times of the year. I live in Chicago... so its finally sunny and warm! BBQ's have all the best foods, and its the perfect excuse to lounge around with your friends, drink too many cocktails, and celebrate some precious time off! Key word - celebrate some time off! Not fussing around in the kitchen all day! 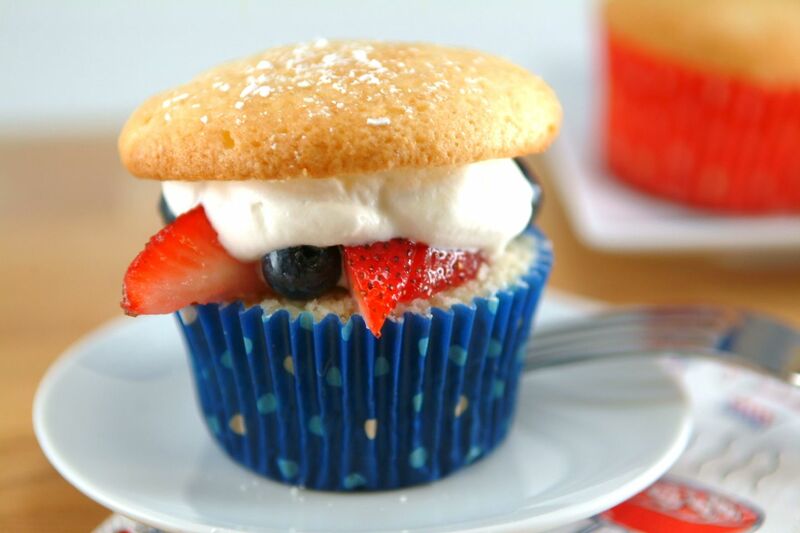 That’s why I love these little cupcakes; they’re super easy - can be made totally in advance besides the whipped cream - and did I mention lower cal? The cupcakes are a rich pound cake that I baked into individual muffin tins. The secret ingredient to their moist texture is canola oil! Less saturated fat and a lot more flavor! Preheat oven to 350°. Line 18 muffin cups with cupcake liners. 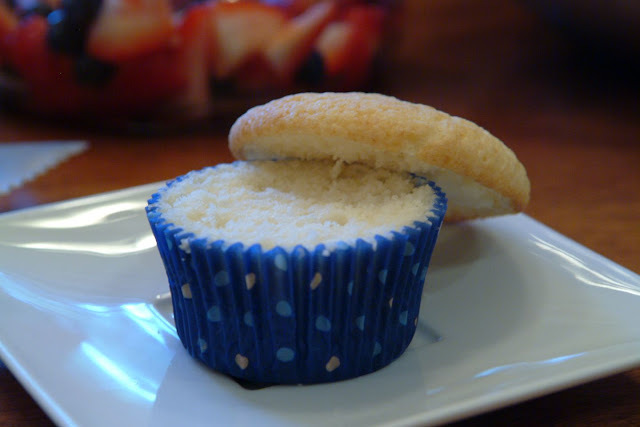 Make the cupcakes- Combine oil, vanilla, 1 3/4 cups sugar, and 1/2 cup butter in a large bowl. Beat on medium speed until well blended, about 5 minutes. Add eggs, one at a time, beating well after each addition. In a separate bowl, whisk together flour, baking powder, and salt. Add the flour mixture and buttermilk alternately to sugar mixture, beginning and ending with flour mixture. Spoon batter evenly among the prepared muffin pan, filling each cup about 2/3 of the way full. 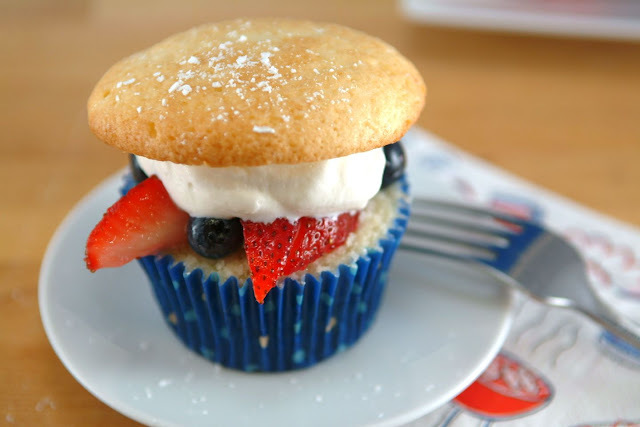 Bake 20-23 minutes or until a toothpick inserted into the middle of a cupcake comes out clean. Cool on a wire rack. 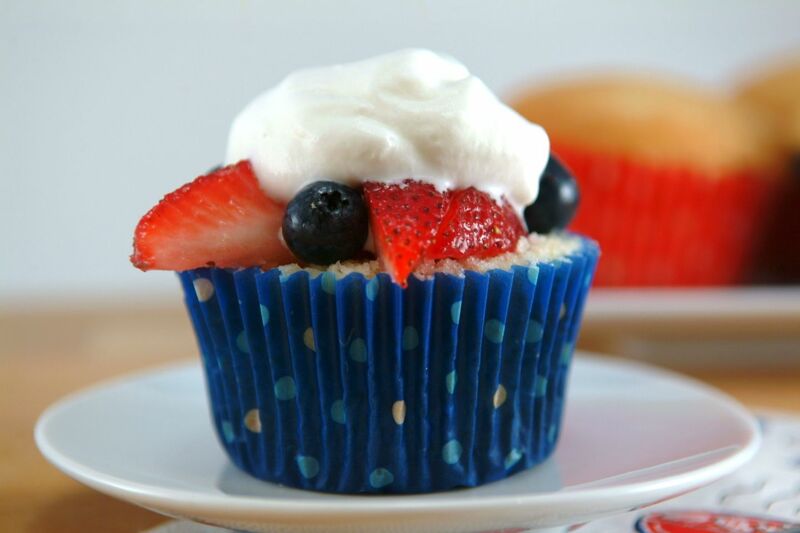 Make the Fruit Filling - Combine strawberries, blueberries, and sugar in a medium bowl. Set aside. Make the Whipped Cream - Beat whipping cream in a medium bowl on medium-high speed until foamy. Add sugar and continue beating until soft peaks form. 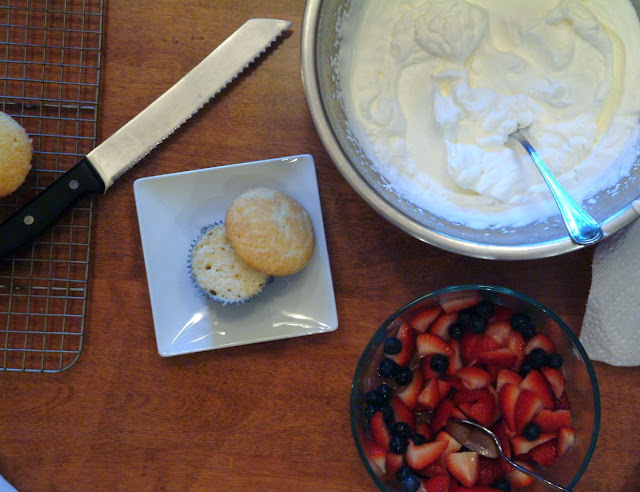 Assemble the cupcakes - Once cupcakes are completely cool, use a serrated knife to carefully cut off the very top of the cake (so you have a muffin top). Place about 1 1/2 tablespoons fruit on top of cupcake bottom, top with whipped cream and finish with the cupcake top. Dust with powdered sugar. Thanks so much again for having me Kayle!! Can’t wait to have you back!